Type: Notebook/LaptopBrand: DellProcessor: Intel Core i3 2nd Gen.
Collection station availableType: Notebook/LaptopBrand: HPProcessor: Intel Core i5 3rd Gen.
1TB HDD 5400rpm SATA. Work confidently on the durable HP 255 Notebook PC. Enjoy this value-priced PC loaded with essential collaboration tools. Enjoy the intuitive experience and help boost productivity with the robust performance of cost effective and energy-efficient AMD APUs. Ending Saturday at 7:11PM BST1d 21hType: UltrabookBrand: DellProcessor: Intel Core i7 4th Gen.
Apart from that laptop in good used condition. See link for PC World WE HAVE MANY. Windows 10 - 64 bit. 20% is included with the price. Windows 10. WE HAVE MANY. Type: Notebook/LaptopBrand: LenovoProcessor: Intel Core i5 3rd Gen.
HP 17t-j100 17.3". 1x HP 17t-j100. FREE 12 Months Warrenty. Our Product Note As part of the sale you"ll receive. Collection station availableType: Notebook/LaptopModel: HP TouchSmartProcessor: Intel Core i7 4th Gen.
Work confidently on the durable HP 255 Notebook PC. Enjoy this value-priced PC loaded with essential collaboration tools. The durable chassis protects the notebook so it looks as professional as you do. Ending 29 Apr at 6:40PM BST3d 20hCollection station availableType: UltrabookBrand: HPProcessor: Intel Core i7 5th Gen.
Apart from that laptop in good used condition. Windows 10 - 64 bit. A new battery would be needed. If you would like us to install a new battery it would be £40 extra. Good refurbished condition. See link for PC World. Up for sale is Acer Nitro 5 Gaming laptop in excellent condition. RAM 8GB RAM. Fully working with no issues. There is no dead pixels on the LCD. But this is a gaming laptop so the battery life will mainly depend on the usage intensity. Ending 30 Apr at 1:09PM BST4d 15hType: Notebook/LaptopBrand: DellProcessor: Intel Core i7 2nd Gen.
HP 255 G6 15.6" HD Laptop,Dual Core AMD CPU,16GB RAM,1TB SSD,DVD-RW,Win10 Pro. 1TB SSD SATA. SOLID STATE DRIVE - SSD. Enjoy this value-priced PC loaded with essential collaboration tools. AMD A6-9225 APU 2.6 GHz. Lenovo Thinkpad T440p. Webcam Laptop. The ram is 16GB! Sorry for the confusion. Core i5-4300M 2.60GHz. no dvd/cd driver. finger print scanner. 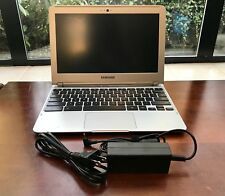 Ending Friday at 8:27PM BST22h 45mCollection station availableType: Notebook/LaptopBrand: LenovoProcessor: Intel Core i5 4th Gen.
SSD Capacity 256 GB. HP Warranty till December 2021 (Nearly 3 Years, or 32 Months to be exact). Still in fantastic condition. Screen Size 14”, 1920 x 1080, FHD. 15.6" LED DVDRW. HP 255 G6 Laptop, AMD A6-9225 2.5GHz, 16GB RAM, 1TB HDD, 15.6" LED, SuperMulti DVD-RW, Windows 10 Professional. 16GB RAM 1TB HDD. 1TB HDD 5400rpm SATA. Work confidently on the durable HP 255 Notebook PC. The manufacturer warranty is valid until June 2019. Series Razer Blade. Processor Type Core i7. RAM Size 16 GB. Graphics RAM Type GDDR5. Graphics Card Ram Size 8000. Hard Drive Size 512 GB. Optical Drive Type None. Collection station availableType: Notebook/LaptopBrand: LenovoProcessor: Intel Core i5 2nd Gen.
Lenovo Thinkpad T550. Usual scuffs and marks that you would expect on a used laptop. Ending 1 May at 8:45PM BST5d 23hCollection station availableType: Notebook/LaptopBrand: LenovoProcessor: Intel Core i7 5th Gen.
1st DVD/BLU-RAY Drive UltraNote Series: 8x SATA DVD±R/RW/Dual Layer ( 24x CD-RW). Battery UltraNote Series 6 Cell Lithium Ion Battery. Keyboard Language ULTRANOTE SERIES UK KEYBOARD. 1st Hard Disk 1TB Samsung 850 EVO SSD, SATA 6Gb/s (upto 540MB/sR | 520MB/sW). Ending Friday at 2:57AM BST5h 14mType: Notebook/LaptopBrand: PC SpecialistProcessor: Intel Core i7 4th Gen.
64 bit. Work confidently on the durable HP 255 Notebook PC. Enjoy this value-priced PC loaded with essential collaboration tools. Ending 2 May at 9:31PM BST6d 23hType: UltrabookBrand: DellProcessor: Intel Core i7 5th Gen.
(FULLY LOADED) Alienware R3 15.6" Gaming Laptop - i7-7700hq, GTX 1070, 16GB RAM, 120Hz screen. Used but in very good condition, with no visible marks or scratches. This laptop can handle any game i have thrown at it comfortably at high settings. Some keys feel sticky after not being used. Dispatched with eBay delivery – Shutl 1 day. Ending Saturday at 9:17PM BST1d 23hType: UltrabookBrand: DellProcessor: Intel Core i7 4th Gen. Powerful and fast machine. Ultra fast SSD drive 256GB. Lid & keyboard - perfect condition, Backlit like new. Used two or three weeks for project, in excellent condition. · Windows 10 pre-installed. LOW PRICE! ALIENWARE 17 i7 3.4GHZ 16GB RAM 4GB AMD GPU 1TB HDD + SSD!